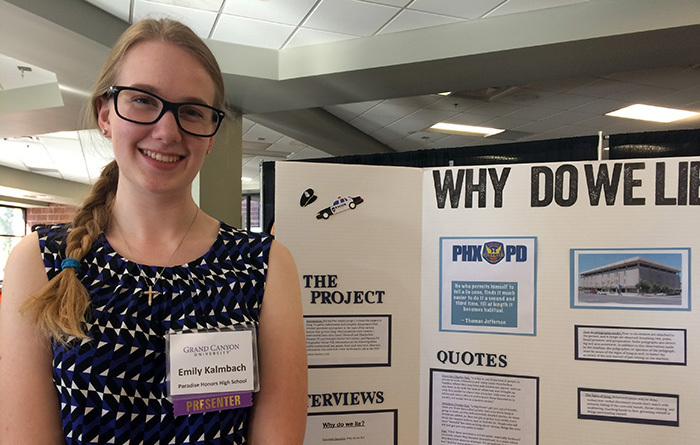 Emily Kalmbach of Paradise Honors High School chose the topic of lying as her inquiry project and showcased her work in a poster presentation at Tuesday’s Canyon Inquiry Project Showcase of Learning in GCU’s North Dining Hall. 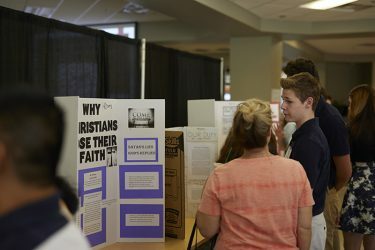 More than 80 students from 10 high schools presented their work. High school freshmen Tam Nguyen, Tolani Olatunde and Diana Arcos nurtured their own little patch of learning at University High School over the past few months. They were given free rein to come up with a project they really wanted to investigate. So they gingerly curated this one: Delving into the Great Pacific Garbage Patch, otherwise known as the Pacific Trash Vortex, a swirl of marine debris twirling right there in the ocean. 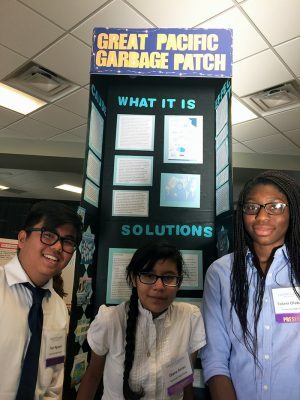 Tam Nguyen, Diana Arcos and Tolani Olatunde of University High School researched the Great Pacific Garbage Patch and offered solutions to the garbage problem. Arcos piped in, “Animals get stuck in this,” not to mention it takes about 50 years for a plastic foam cup to decompose in the environment and 600 years for fishing line to decompose. Olatunde countered this problem by offering some solutions: “We should try to implement the bottle bill,” a law that requires deposits to be paid on beverages sold in recyclable bottles and cans to encourage recycling. The team also suggested using plastic lumber benches rather than wooden benches as a way to help the environment. The Great Pacific Garbage Patch was just one of a slew of projects presented by more than 80 students during the showcase, a massive consortium of knowledge that peppered four campus locations in a bevy of forms — not only poster presentations but the breakneck speed “pecha kucha” presentations (a Japanese term meaning “chit-chat,” in which 20 slides are shown for 20 seconds each) and performances, too. This teaching style rejects static learning – memorizing, listening to lectures and spitting out facts – and opts for active learning. Instead of just memorizing dates of big historic events, for example, students tackle a question, quandary or situation – often coming up with the question themselves – investigate that problem, then come up with solutions, usually through small-scale projects. “This all happened about a year ago, when we had many, many high school teachers apply for a grant given by our university. We looked for teachers who were looking at truly changing their practice of teaching,” said Kathryn Scott, Executive Director of GCU’s Strategic Educational Alliances. The high schools chosen to participate in the Canyon Inquiry Project were Bourgade Catholic, Heritage Academy, East Valley Academy, Buckeye, Combs, Skyline, Pinnacle, Paradise Honors, University and North Valley Christian. Teachers received $1,000 awards for completing the project along with $175 school grants for classroom projects. 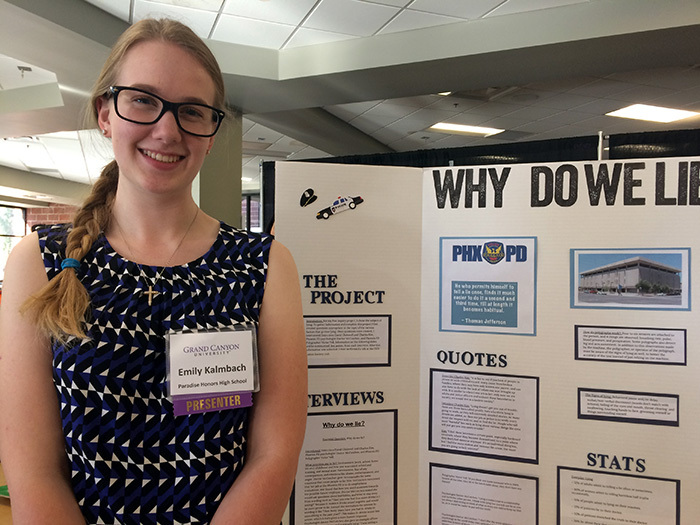 Besides the Great Pacific Garbage Patch, another poster project on display was that of Paradise Honors High School’s Emily Kalmbach, who explored why we lie. “My parents are in law enforcement,” said Kalmbach, who herself is interested in going into a law enforcement career, perhaps forensics. She interviewed two police detectives, a psychologist and a polygraph tester. Kalmbach said her project came about after her class read “The Canterbury Tales.” From that work of literature, the class took several main ideas touched upon in the literary work – lies and deceit, women and femininity, religion — and from that developed some essential questions. She developed her project based on some of those main ideas. Teacher Mandi Webster of Combs High School said her students’ projects didn’t stem from a literary work, like at Paradise Honors. “We’re math teachers. We had to first introduce all of our material before we asked the kids to investigate. … We asked the students to find a problem in the world and how they were going to use math to solve it,” Webster said. One student, Miranda Garcia, who lives on a farm, was interested in water evaporation and how that’s a problem for us. Webster said Garcia found a mathematical function related to the evaporation of water and was able to use math to find a solution. “We wanted kids to see that math is in your everyday life,” Webster added. 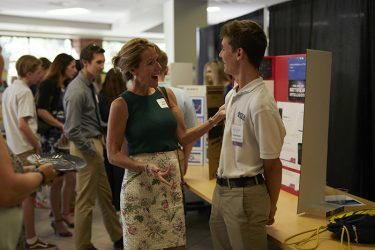 “What was fun about the project is we asked the students to find something they’re passionate about,” and it was interesting to see the strong connections the students had to their work. Maria Ramos Hernandez of East Valley Academy in Mesa shared a video that expressed her feelings about the medical industry and medical insurance. Mylie Critchlow, Jacqueline Douglass and Ester Hyman of Heritage Academy tackled the problems social media can cause, from FOMO (Fear of Missing Out) to cyberbullying: “We’re here to tell you, social media is more than a form of entertainment,” they said in their pecha kucha presentation. 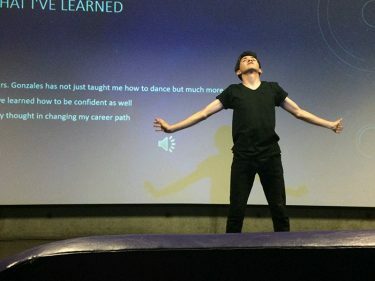 Other student projects delved into depression, school shootings in the United States, a dance called “The Way I Do,” how the education system is failing students, how relationships affect women writers, and much more. The showcase ended with $10,000 of scholarships awarded to students.